The Boyue Likebook Mimas is garnering a ton of attention from people who want to make digital notes or edit PDF files. This device has a WACOM screen, which makes it compatible with the accompanied stylus, which has over 4096 degrees of pressure sensitivity. One of the big selling points is that this is the first 10.3 inch e-reader that has a glowlight, which means you can draw in the dark. The Mimas note taking experience is very responsive. You can use different shapes, like squares or circles and resize them on the fly. There are options to delete the last thing you drew, circle an area and delete everything that is inside or just kill the entire page. I feel that the Remarkable and Onyx Note do a better job at providing more advanced options for drawing, but the latency on the Mimas stylus is next to nothing, anytime you draw, there is no playing catch-up with the E-Ink screen, everything is done on the fly, just like an Apple Pencil on an iPad. There are 24 different preset backgrounds that ship on the Mimas. You have everything from College Rules to Sheet Music. Peter really dug the time schedule background that let him plan his day and write down times he had meetings or doctors appointments. 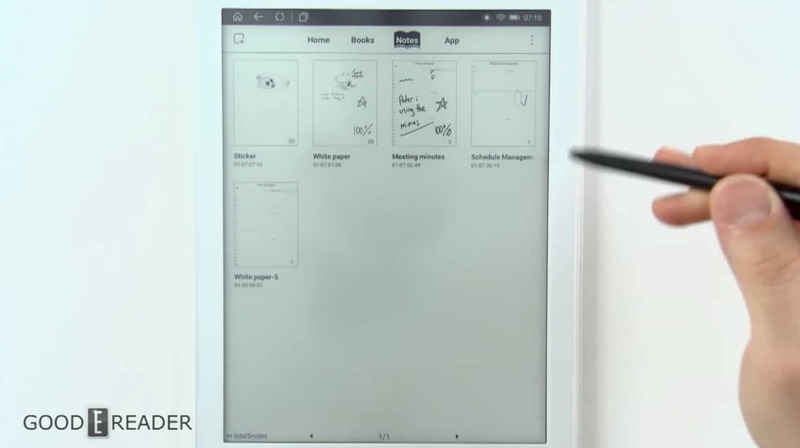 The Mimas has a default PDF reader and can you draw on pages, make notes and annotations on anything that you sideload on it. You can save anything you edit as an entirely new independant file, so you can have the virgin file with no edits and your copy with all of the things you have done. The stylus has pressure sensitivity within a PDF file, but there are not very many advanced options. This device is currently retailing for $459 and can be purchased from the Good e-Reader Store. 10,3″ of screen? what are exactly screen dimensions? Take your $50 markup and shove it. I will be obtaining it from a more reasonable seller thanks. It looks like Mimas is a great product but I will not buy it from Good E-Reader store. It is more expensive than the other seller + customer service is non existent. I recently bought Likebook Mars and my experience with this store was terrible. read their return policy. You will realize that they do not have a proper return policy. Be aware! I absolutely agree with you. So guys stay away when it comes to buying ereaders.